Have you ever had to ride behind a boat with a driver that was not used to pulling a wakeboarder? 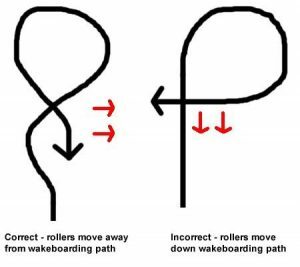 They could not maintain the speed you wanted, they would drive through another boat’s wake, they would send rollers back down your path and they had no idea what a double up is. I have, and it makes the biggest difference in a session if you have an experienced wakeboard driver pulling you. The skill level of the people that come to this website for information on wakeboarding ranges from the seasoned pro to the weekend warrior, groms to masters and owners to thirds. One thing that everybody should learn, boat owner or not, is how to correctly pull a wakeboarder. In this article, I will let you in on tips to help you correctly pull a wakeboarder. This skill will help your crew progress, it will help thirds to become regulars and it will help you, and others around you, maximize the enjoyment of the sport. Your goal, as the driver, is to maximize the run for the wakeboarder by maintaining the riders desired speed, getting the rider the best possible water conditions, maintaining straight lines and performing consistent double ups. If you can do all of these things, plus add a few tips that I will get to below, you will be able to correctly pull a wakeboarder. If you don’t have some type of cruise control installed on your boat, maintaining consistent boat speed requires a lot of attention on the part of the driver. Any distractions can easily result in the speed dropping or raising one or two mph, which will definitely be noticed by the rider. Some may use the tachometer to maintain speed by getting the engine speed up to a certain level and then keeping their hands off the throttle. Although this makes things easier for the driver since they no longer have to make adjustments, it will often result in a less consistent pull than if the driver keeps an eye on the speedo and makes minor adjustments accordingly. This is because there are a lot of factors that can affect engine RPM besides the speed of the boat across the water, such as rider pull, double ups, wind, water conditions, etc. When using the speedo to maintain speed, the driver should keep his or her lower arm on armrest above the throttle. This allows the driver to hold the throttle and make adjustments using only their fingertips. This solid foundation allows precise adjustments to be made to the boat speed without the rider noticing. Oftentimes, drivers will talk too much, mess with the stereo, eat a sandwich or turn around and watch the rider. If you want to see the rider as they are pulling off their signature moves, have someone video tape them. Your number one priority should be maintaining speed, maintaining a straight line and looking ahead of you. All of these other things will prevent you from giving your rider the perfect pull. 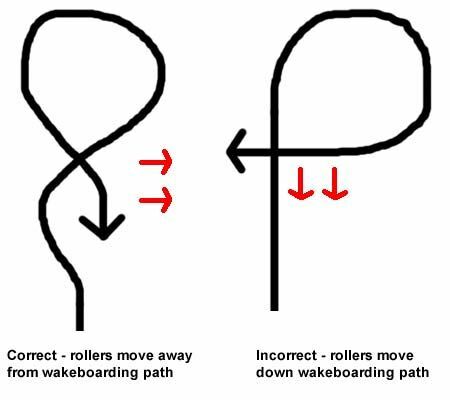 To maximize the number of cuts the wakeboarder gets at the wake, refrain from sweeping turns and try to always drive in a straight line. If you have to make a turn, make it sharp. Remember to adjust the throttle to keep the speed consistent when the boat is turning. This is pretty much self-explanatory. Get to know your lake and how the wind and boat traffic will affect the water when it blows from different directions. This will enable you to find the smoothest conditions available even when the weather and crowds are not cooperating. I guarantee you the rider will appreciate it and return the favor when it is your turn to ride. Getting the rider out of the water quickly does two things. First, it gets the boat up to speed faster so that the rider can start throwing tricks sooner. Second, it causes less fatigue for the rider than when they are pulled up slowly. Dipping the nose is a common occurrence when the driver turns around to pick up a fallen boarder. It’s caused by crossing over your own rollers on your way back to the rider. There are two ways to avoid this. The first, and most common, way is to accelerate over the rollers. This lifts the nose up high enough to clear the rollers. The second way is much easier, but not as well known. When you see the rider fall, simultaneously turn the wheel to the left and decelerate. Once you decelerate, turn back around to the right and accelerate slowly towards the rider. What you will notice is that there will be no rollers to cross back over. Try it. You will be very surprised. A power turn is a high-speed turn that is typically made very quickly in order to retrieve a fallen wakeboarder. The power turn sends rollers out in all directions, which will ruin your water and ruin the water for others around you. The best way to get to a fallen boarder is as described above. Once the rider falls, turn the boat to the left and decelerate. After the boat stops, turn back to the right and accelerate slowly towards the rider. The only circumstance in which a power turn is necessary is when the rider is hurt or in danger of getting hit by other watercraft. You should ask the rider some questions before they jump in the water: What speed do you usually ride at? Where on the lake would you like to ride? Do you want any double ups? If so, toeside or heelside? It’s also a good idea to ask the rider how the driving was after their first fall. Was the speed OK? Is there anything different that you would like me to do? This also gives the rider the opportunity to say something that they might not have brought up otherwise. A double up occurs when the boat makes a full turn, about 150 feet in diameter, and comes back around to cross over its own wake at about a 90-degree angle. This creates several double-sized peaks at the points of convergence of the boats wake and the rollers over which it is crossing. The most important thing to remember when driving a double up is to be at the exact speed at which the rider usually rides before the boat hits the wake. Also make sure the boat is going in a straight line for about 50 feet or so before crossing the wakes. This will ensure that the rider will be able to get set up and make the same cut into the double up as they do for a regular wake jump. Don’t forget to keep up the boat speed while turning since the turn itself will tend to slow the boat down if you leave the throttle alone. Once you come out of the turn and are getting ready to cross the wakes, you’ll need to pull back on the throttle slightly to keep the rider at their preferred speed. In order to keep your rider happy after the double up is complete, be sure to drive the double up in a way that does not send rollers down the path on which you’ll be riding. You can accomplish this by keeping the boat from driving perpendicular to your line as illustrated below. Always be aware of the federal, state and local laws and ordinances that apply to the body of water on which you’re riding. It’s especially important to carefully read the rules for any body of water with which you’re not familiar. Many lakes have different rules governing the traffic patterns, prohibited areas, safety requirements and more. Nothing will spoil the day faster than an expensive ticket or somebody getting hurt just because you broke a rule that you didn’t even know existed. If you’re not driving, maybe you should be. Driving is a chore. The driver has to think about everything described above and they don’t even get a good look at the tricks the riders are throwing behind the boat. Don’t be afraid to ask the boat owner if they would like to observe while you get behind the wheel. It is nice to let them just relax and watch the riding sometimes. It really depends on the boat owner, but I know that most will be grateful for the opportunity, especially if they trust your skills (and after reading this article, who won’t trust your skills). Don’t be afraid to print this article out and take it on the boat with you. Most people don’t want to openly criticize a poor driver, and for good reason. However, this article can be presented as, “Hey, look what I found on WakeWorld.” It might start a discussion and enable everyone to talk about some of the suggestions that I have mentioned. In fact, make several copies in case you run into somebody out on the lake that is making it all too obvious by their actions that they have not read it. If you are a third now, this knowledge is a must if you want to get invited back. If you do not feel comfortable pulling a wakeboarder, ask the boat owner to help you learn. Most will be happy to help you out so that they gain another driving third that they can call on when it’s time to hit the water. The only way to perfect your driving skills is to practice out on the water whenever you get a chance. These tips may not make you a Travis Moye (Pro Wakeboard Tour driver), but they will help you to be the best driver that you can and get you that much closer to the perfect pull. Big thanks to WakeWorld for this great article! Error: Error validating access token: Session has expired on Friday, 23-Nov-18 07:34:26 PST. The current time is Friday, 19-Apr-19 02:21:51 PDT.